DUBAI, United Arab Emirates, Nov. 13, 2011 /PRNewswire/ -- Boeing (NYSE: BA) and Dubai-based Emirates Airline today announced an order for 50 Boeing 777-300ERs (Extended Range) plus options for an additional 20 of the popular twin-aisle commercial jetliner. The order, with a value of $18 billion, makes this the single largest commercial airplane order in Boeing's history by dollar value. It also makes 2011 the best-selling year for the 777 program, surpassing the previous record of 154 orders set in 2005. 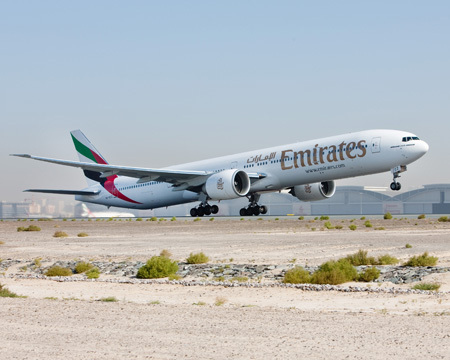 With the Emirates order, the 2011 net order book for the 777 currently stands at 182. The options for 20 additional airplanes is valued at $8 billion. "The 777's reliability, performance and operating economics have firmly established it as the backbone of our fleet," said His Highness Sheikh Ahmed bin Saeed Al Maktoum, chairman and chief executive, Emirates Airline & Group. "We have an ambitious and strategic plan to continue growing our international network and especially increasing our long-haul, non-stop routes. This order supports our fleet expansion and reiterates our commitment to operating a modern fleet for the benefit of our passengers and to ensure operational efficiency as well." Emirates is the world's largest 777 operator with a fleet of 94 777s through direct purchase and lease, plus additional unfilled orders on backlog for 41 777-300ERs previously on order. It is also the only airline in the world to operate every model in the Boeing 777 family, including the 777 Freighter. Emirates took delivery of its first Boeing 777 – a 777-200 in 1996, and since then, the airline has deployed the 777 on short, medium and long-haul routes. "This is an extremely proud moment for us as it not only underscores Emirates' ongoing confidence in the 777 but also makes this the single largest order by dollar value in Boeing's history," said Jim Albaugh, president and CEO of Boeing Commercial Airplanes. "As the largest operator of the 777 in the world, Emirates has played an important role in development of the airplane and its input over the years has been invaluable in the development of the 777 program." The Boeing 777 is the world's most successful twin-engine, long-haul airplane. The 777-300ER extends the 777 family's span of capabilities, bringing twin-engine efficiency and reliability to the long-range market. The airplane carries 365 passengers up to 7,930 nautical miles (14,685 km). Boeing incorporated several performance enhancements for the 777-300ER, extending its range and payload capabilities. Excellent performance during flight testing, combined with engine efficiency improvements and design changes that reduce drag and airplane weight, contributed to the increased capability.